Now visible to the naked eye under ideal conditions, Comet ISON could get even brighter if it survives its trip around the sun. If you are in the Northern Hemisphere, this weekend may be your best chance for some exceptional stargazing. Comet ISON is rocketing toward our sun, and this past week it experienced an "outburst" - a sudden increase in brightness, making its green tail visible to the naked eye in some places. The comet is a sungrazer, meaning it will pass very close by the sun in its orbit through the solar system. Robyn Foret, chair of the education and public outreach committee for the Royal Astronomical Society of Canada, told the CBC, "It's naked eye if you're deep, deep in the country, the sky is pristine and clear and your eyes are fantastically good. That said, with a good pair of binoculars on your deck, if you know where to look in the sky, you will see it." In a few days, it will be lost in the glare of the sun (and trying to find it with binoculars then can cause serious damage to your eyes). NASA has been tracking the comet's approach since September 2012. The comet has never before passed by the sun, so the rocky material, water, and other frozen components have been untouched since the earliest days of our solar system's formation. This makes the comet "dynamically new", and it is the first comet in at least 200 years to be both dynamically new and a sungrazer. Astronomers will use observations from space-based platforms like the Hubble telescope and ground-based observatories to learn about the initial development of our solar system from this comet. An image of the comet, taken by Hubble when the comet was near Jupiter's orbit on April 10, allowed astronomers to estimate the comet's nucleus at between three and four miles across. Astronomers speculated at the time that the comet might reach levels of brightness in December greater than the Moon. The sudden increase in brightness this week may indicate that the comet is beginning to break up, and that means it may not survive its trip. In a blog post, NASA's Comet ISON Observing Campaign says, "We can not and do not guarantee that it will survive the next few weeks and become naked-eye visible in our night skies." Around Mars, at about 220 million miles from the sun, the solar radiation began to boil the frozen water in the body of the comet. That same solar radiation causes the aurora borealis and aurora australis here on Earth. It will get much more intense for comet ISON. The comet will reach perihelion, the point where it passes closest to the sun, on November 28, 2013. If it survives the assault of solar radiation and gravitational stress from passing just 730,000 miles from the sun, the comet will continue in its orbit and head back out of our solar system. 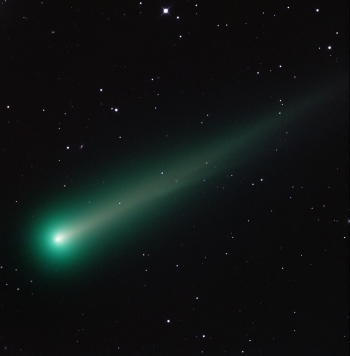 On December 26, the comet will pass within 40 million miles of Earth. The slingshot around the sun may give the comet enough momentum that it might never return to our little corner of the galaxy. Given that the comet may not make it around the sun, or ever return to our solar system again, it might worth the discomfort of getting up before dawn to catch a glimpse. Besides, when else will you get a change to crack jokes about the Red Messenger?